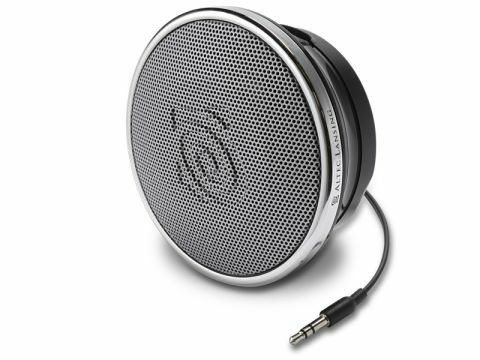 This wee speaker, which can easily slip into a pocket, pumps out good sound and goes very loud, considering its size. The case is a single drum with a single driver inside that points out and up. Sound goes wherever you point the silver grille and also resonates pretty well out to the sides. Underneath is the battery bay, which holds three AAA batteries. The battery bay, grille and connecting 3.5mm input cable are all good quality. The chrome band that rings the top edge of the design - you twist it to turn the speaker on and off - is the only weak spot in the design. It sometimes sticks and feels plasticky, although it's not a deal-breaker. Battery life is also short at 24 hours. Given the low price, we can overlook these shortfalls. It's the sound quality that really sells this unit to us. It's excellent, and would still be excellent for speakers twice or three times the size or price. Quite when you would need to use it is another matter.